Pregnancy produces changes that if adjusted to can allow continued ease and freedom of movement. 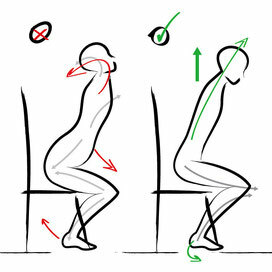 If your posture has become compromised through daily habit then it can be harder to adjust to these changes. It's very common for pregnant women to experience back pain, especially in the later stages of pregnancy. As the baby grows, a woman's ligaments become more relaxed (due to the release of the aptly titled hormone relaxin) and the extra weight of the baby tends to drop forwards and down, tilting the pelvis, so that the pregnant mother often loses the length and strength in her lower back. This extra tilting of the pelvis can also contribute to pain in the pelvic area, as in Symphysis Pubis Dysfunction (SPD). In addition, the growing baby causes a woman's center of balance to change. 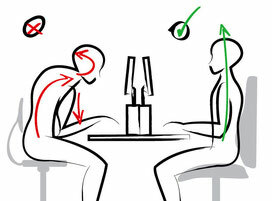 With the increased forward weight, the usual habit is to compensate by leaning back. This puts extra pressure on the sacrum and lower back. This need not been an inevitable result of pregnancy. A growing baby occupies more internal space compressing heart, lungs and other internal organs. By capitalising on the internal support structure, breathing and digestive issues can be avoided. With the Alexander Technique you learn to reduce compression by allowing the torso to expand naturally, literally giving more room to breathe. What you learn with the Technique during your pregnancy will also be helpful when feeding and caring for your new baby, as the Alexander Technique is an important tool in learning how to manage the enjoyable yet demanding tasks of parenting. Learning to look after yourself while carrying, washing, feeding, bedding, or lifting your baby, will equip you with better coping skills and make the extra demands on your body more manageable. Many expectant mothers need to work right through their pregnancy or have older siblings and family to look after. Make your pregnancy and birth less stressful and demanding on body and mind. You can learn the Alexander Technique any time in your pregnancy, but the earlier you start the more you will benefit.